Berlin is famous of being kind to drug addicts: regardless of what you take it’s easy to get it, will be relatively cheep, and in case of an overdose the doctors know exactly how to get you back to life. For a long time I kept clean – but the city sucked me in, and I developed an addiction. The Saturday market at Boxhagener Platz is a vibrant place to get fresh food of all sorts: vegetables, spices, meat can be found here as well as beautiful cakes and cottage cheese ice cream – and of course, since Germany has a seaside, fresh fish is all over the market. The goods are coming from the farmers themselves, and the shopping experience lacks the pharmacy feel you get in Bio Company shops. Another point why food markets are great. For the hungry who looks for something different than thai takeaways or döner kebab, this place is the best to be in a Saturday luchtime. 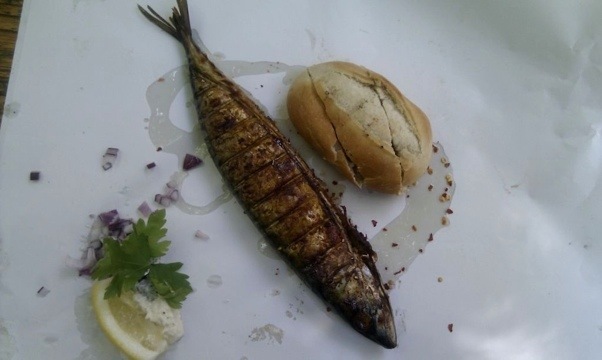 The smell of grilled meat and sausages are coming from the direction of the caravans, which is also the place where I discovered the object of my addiction: the smoked mackerel. These fish dishes are coming with horse radish and algae salad, and you can choose between a filet sandwich and a whole fish. The price is between 3.5 and 5.5 euros (after 4pm its usual to get discounts). Regardless of the format, the taste is heaven, and we could have it every day – but since the food market is only once a week, we are safe. Until we find another sugarman.